Comments Off on New STEP Internship Postings! We all envision UMass Boston students finding careers in which they can grow and thrive. It all starts with real work experiences. Students can kick start their Finance or Marketing career with the Venture Development Center, Pressure Biosciences, Openview Labs and Clarilegal! Located on the waterfront and at the heart of UMass Boston, the Venture Development Center is a leading Boston business incubator for emerging technology and life sciences companies seeking strategic growth opportunities. The VDC offers professional and experienced mentoring, connections to bright and skilled interns, connections to valuable industry resources, links to capital funding and close proximity to UMass Boston’s faculty and university research. The VDC offers state-of-the-art facilities, excellent customer service, and a top-tier support network in a package designed to meet the immediate and long term needs of startup businesses. The VDC is looking for an enthusiastic student to become an integral part of the busy day-to-day operations of a business incubator, become part of the operations team and assist Program Manager in managing budgets, purchasing, accounting and personnel procedures and transactions and review for accuracy and compliance with University policies and procedures. Pressure BioSciences (NASDAQ:PBIO) is a Life Science Tools company developing innovative methods of biological sample preparation exploring a forgotten dimension in thermodynamics – high hydrostatic pressure. The company’s life science research tools based on proprietary Pressure Cycling Technology (PCT) has gained acceptance in proteomic and genomic biomarker discovery and is entering pathology, diagnostics and forensic science markets. Pressure BioSciences seeks a marketing intern to join them 10-20 hours weekly for the summer. • Conduct Web and phone based research in the US life science/biotechnology research market to identify appropriate product features, specifications and identify targets for marketing and sales. • Conduct research of biotechnology, medical literature, and other journal/news databases and summarize key points of relevant articles relating to poorly served areas of biological sample preparation for genomics, proteomics and next generation DNA sequencing. • Compile succinct reports documenting the research for discussion and further evaluation by Pressure BioSciences senior management. • Work with VP of Research and Development and VP of Engineering to summarize the customer feedback into succinct product specifications. • Work with VP of Sales and Marketing to revise strategy for lead generation and customer outreach based on research knowledge and opportunities identified. • Maintain Pressure BioSciences’ website and email marketing campaigns. • Accept special assignments as required. • To apply, please send a cover letter and resume to careers@umb.edu and cc vdc@umb.edu. OpenView Labs is the strategic and operational consulting arm of OpenView Venture Partners, a venture capital fund with more than $440 million under investment. The OpenView Labs teams provide an extensive range of high impact value-added services to the OpenView Venture Partners’ portfolio companies; executing various strategic and operational improvement projects and helping young software companies adopt best practices in all functional areas. The OpenView Labs’ teams include dedicated, highly experienced operating executives, with areas of expertise in high-tech sales, marketing, research & development, organizational and operational functions, and general management. OpenView Labs, the consulting arm of OpenView Venture Partners is looking for a paid Market Research Intern to assist the Research & Analytics team in strategic consulting engagements with its current portfolio of 20 high growth early stage software companies. The selected candidate will have the opportunity to learn valuable strategy consulting, market research and data analysis skills while working closely with OpenView Labs consultants and portfolio company executives. The team typically engages in a very wide variety of projects, which include but are not limited to: mergers & acquisition target research, market exit opportunity research, market entrance strategy, customer analytics, competitor analysis, market segmentation projects and marketing channel analysis. ClariLegal’s mission is to improve the procurement process for Electronic Discovery (“eDiscovery” ) services for buyers and sellers by reducing cost, saving time, improving transparency and allowing data-driven decision-making for our stakeholders. The ClariLegal team is comprised of veteran eDiscovery professionals who have extensive experience in eDiscovery Services, Supply Chain, Project Management and Social Media Management software. We understand firsthand the pain and inefficiencies involved in the purchase and sale of eDiscovery services. As a result, we have a deep understanding of how to make the procurement function more efficient. Clarilegal is currently a hiring part time marketing intern who will become a key member of the team to help reach Clarilegal’s marketing objectives such as managing social media campaigns, writing and maintaining blogs and supporting the marketing team. Comments Off on Career Day Workshop for New/Recent Graduates! Career Day Workshop for New/Recent Graduates! Are you ready to say good bye to UMass Boston and hello real world? Get your professional career off to a great start! You may register on MyCareer Online. A light lunch will be served. Business casual attire recommended. The Sconset General Store on Nantucket is seeking full time employees for the whole summer and provides housing. Pursuing a Business Loan: The Big Picture Are you an entrepreneur looking to access financing? : Starts at 6:00 PM in the Harvard i-lab, at 125 Western Avenue, Allston. MAP Miles: 100. For in formation about the guest speakers contact the Boston Regional Office & Minority Business Center at 617-287-7750 or sbdc@umb.edu. As you might have noticed, this is the time of celebrations, certificates and receptions across campus. It is the most exciting time of year, in that we can stop and recognize so many outstanding student accomplishments. 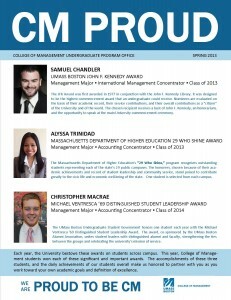 This spring, we are especially proud – CM PROUD – to share with you that three College of Management students won three very high honors and awards. Sam Chandler will be the 37th recipient of the John F. Kennedy Award for Academic Excellence—the highest honor given to one graduating UMass Boston undergraduate students. Sam will address his fellow graduates at this year’s commencement ceremony (so cheer loudly!). Alyssa Trinidad was recognized as one of the top 29 students across the state who are studying at a public higher education institution with UMass Boston’s 29 Who Shine Award, given by the Massachusetts Department of Higher Education. Christopher MacRae was selected to receive the Michael Ventresca ’69 Distinguished Student Leadership Award by the Undergraduate Student Government and the Alumni Association. These three awards are special in that any student, in any major or college, has the opportunity to be the recipient, through hard work and dedication to the principles that each award represents. 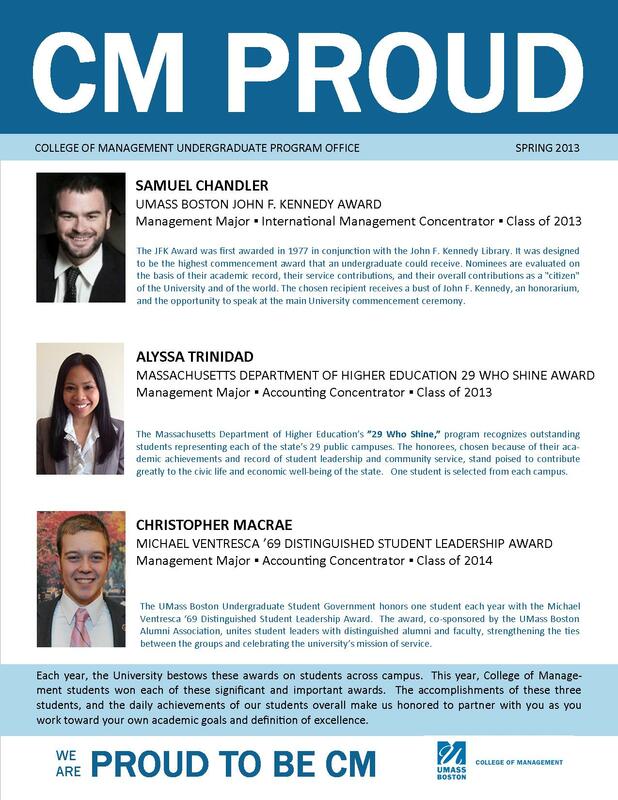 While we have always known we have outstanding students in the College of Management, we are proud that others recognize this as well. So with these awards, and the accomplishments – large and small – of all of our students, we are: CM PROUD. Please join us in congratulating these three students. Click the image below, or each student name above, for more information. Small Group Communication: Starts at 9:00 AM in the Campus Center 1st Fl Room 1313. Event Capacity: 16. MAP Miles: 50. Special Guest Speaker: David Earnhardt. Technical Foundation of Information Technology: With courses on Business Intelligence, Data Mining and Data Warehousing. Applications of Information Technology: With courses in Computer Security, Forensics and IT Controls and Audit. Information Technology Management and Strategy: With courses in Knowledge Management, Information Systems Strategy, Information Technology Services and Operation and Customer Relations Management. Coursework and student resources help students develop the communications, presentation, and analytical skills, as well as the technical, quantitative, and decision-making abilities, required of contemporary managers. The MSIT program is committed to the success of all its students, both academically and professionally, and to providing the individual attention and support that make their accomplishments a reality. Meet Our Faculty and Learn More! RSVP to gradcm@umb.edu. Please indicate if you will join us in person, or via webinar log-in. Log-ins will be on a first-come, first-served basis.